Cambridge is strange. One of the brilliant things about hosting the User Experience in Libraries Conference (UXLibs) last week at St. Catherine’s College was the unique location’s ability to make everyone immediately feel like an anthropologist newly arrived at a fieldsite. A sign announced the college closed to the public; we were all (with a couple exceptions) strangers here. Anthropologists often emphasize taking on the role of a professional outsider: a stranger who is a novice in the local culture and must ask questions of everything in order to understand. This comes more naturally in an unfamiliar place, but takes conscious practice at home. Figuring out the norms of St. Cats and Cambridge (e.g. Why can’t we walk on that grass? ; Who/What exactly is a college fellow? ; Punting doesn’t involve a ball?) underscored the ethnographic importance of understanding the particularities of a locality and place. This theme was central throughout the conference, and Cambridge as a space and place showed through in all of the impressive work and recommendations of the UX project teams. This should probably come as no surprise; a key tension within ethnographic methods is working out which findings are specific to a fieldsite and which are generalizable. Everywhere is strange and complicated, but often in similar ways. As Donna Lanclos pointed out in her keynote, as ethnographic practitioners we need to engage both in ethnography, which focuses on the describing and explaining the particular, and in ethnology, which compares and synthesizes. Over the last few years we’ve made significant strides in library ethnography, but library ethnology is still relatively undeveloped. One of the things I hope will come out of gatherings such as UXLibs is the creation of international communities and networks of practitioners that can start thinking through comparative and theoretical questions about libraries, user experience, and information in higher education. Building capacity and infrastructure is part of working toward these goals, and this will require support from library administrations. Embracing an ethnographic approach can be challenging, often precisely because of the strengths of the method: it seeks to destabilize by questioning fundamental assumptions about the way things work. Ethnography is not expensive, but it’s also not free. Some money is required for things like incentives to research participants, transcription, and perhaps some specialized software and hardware. But more importantly, ethnography requires time and maybe quite a lot of time. This means shifting resources so that people don’t have to take on ethnographic projects over and above their other duties. Qualitative and quantitative approaches are not antagonistic. Each approach marshals different types of evidence and data. Both are valid, and both can be representative. Ethnographic projects need room to ask difficult questions. Allow everything to be on the table, make crazy sounding assertions, and say things that might seem heretical to librarianship. If all this sounds scary, that’s OK. In fact, this is part of the process. Remember you’re dealing with a discipline that takes dumping someone in a foreign country and leaving her there alone for a year or two as its mythologized rite of passage. If it isn’t a little bit scary, you probably aren’t challenging yourself enough. That’s my jetlagged and two cents (two pence?). UXLibs has already had several other excellent summaries from Andy Priestner, Shelly Gullikson, & Ned Potter, that I encourage you to read as well. 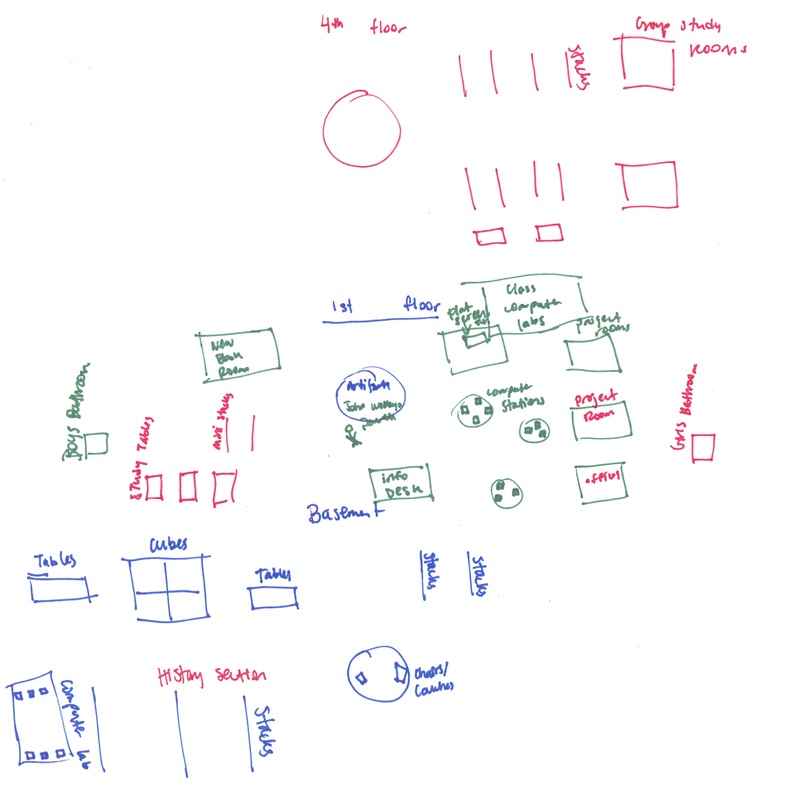 After Donna Lanclos’s recent post on using my library cognitive mapping method, a few people asked me to briefly write up my approach to coding the drawings. 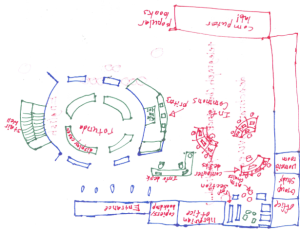 I developed the cognitive mapping exercise based on the sketch maps protocol used by Kevin Lynch in The Image of the City, which was introduced to me by an urban planner I met during my fieldwork on the Polish-German border. 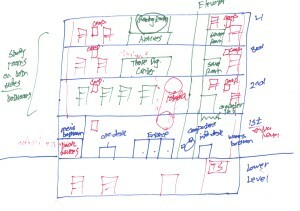 Incidentally, I thought I was the first person to apply this method to libraries, until I ran across Mark Horan’s 1999 article, “What Students See: Sketch Maps as Tools for Assessing Knowledge of Libraries,” which used the same urban planning source materials to develop a very similar approach. This method assumes that the things people most associate with their “mental map” of the library will appear as elements in the drawing, and that the most important things (or strongest associations) will appear earlier. Therefore, by changing the pen colors, this approach creates both a spatial dimension and a temporal dimension. 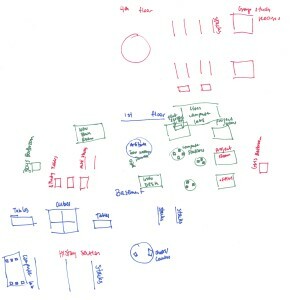 The mapping activity was conducted away from library building itself both to obtain a diverse cross-section of students (e.g. 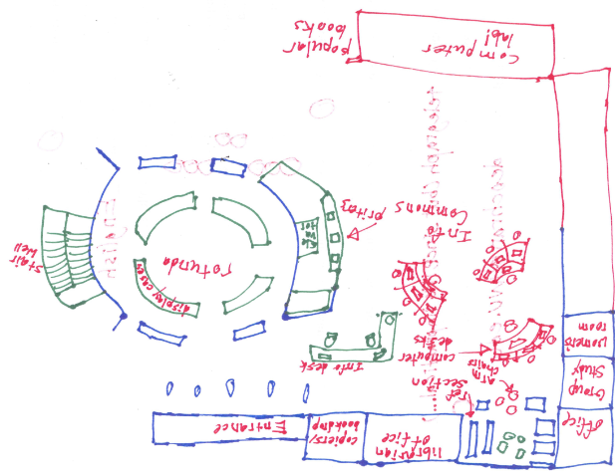 students who do not regularly use the library) and to obtain a picture of how students conceptualize the library’s spaces that was not influenced by any direct visual references. Coding these images basically involves counting the elements drawn in order to construct two indexes: a identification index, which is the number of times that an element is drawn divided by the total number of individuals participating (i.e. the percentage of the time the element occurs), and representativeness index, which is the number of times an element is drawn divided by the number of times that category of element is drawn (e.g. the number of times a study room on the first floor is drawn divided by the number of times all study rooms are drawn) (See Colette Cauvin’s “Cognitive and cartographic representations : towards a comprehensive approach” for additional discussion). I also constructed a temporal index for each element by coding the three colors in order (1 = Blue, 2 = Green, 3 = Red) and calculating the mean value for each element (you could do more complicated things by combining the indexes if you are mathematically inclined, however, I’ve found that these three get at most questions). You can set up a spreadsheet in excel to do this coding, or utilize the visual coding built into a QDA software package. This process can be time consuming as every element must be coded. You also need to decide which categories you will use (e.g. “chairs,” “computers,” “rooms”, etc.). The presence or absence of all elements need to be coded for for every drawing, so if you find a new element in a later drawing, you need to go back and code for it in all the previous drawings (this is akin to coding against a closed codebook). This is all fairly straightforward, except that there can be a lot of ambiguity in the drawings and you will have to decide rules for when something “counts” (this is why having students label things helps). 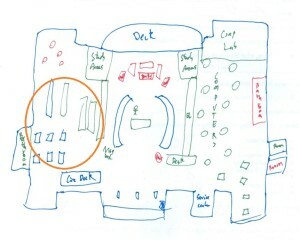 For example, in the drawing below, the computer stations (circled in orange) are clearly labeled, so these might be coded as element = “first floor information commons computers,” category = “computers,” time=1. 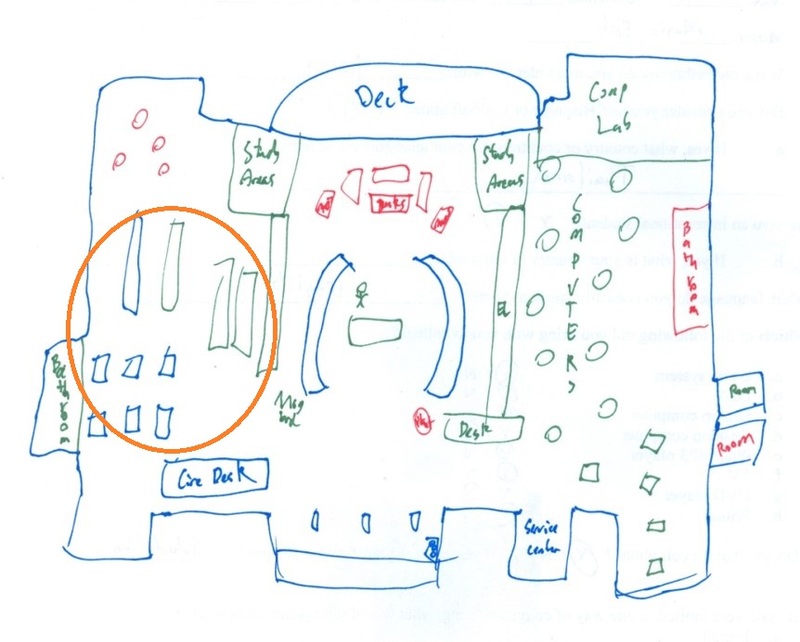 In contrast, the following drawing has unlabeled squares and rectangles (circled in orange) where there are tables and periodicals shelving. In this case, the coder must decide what the element represents. Since the squares are in the correct position, we coded these as tables, and since the rectangles are the correct shape and in the correct position we coded these as periodical shelves. 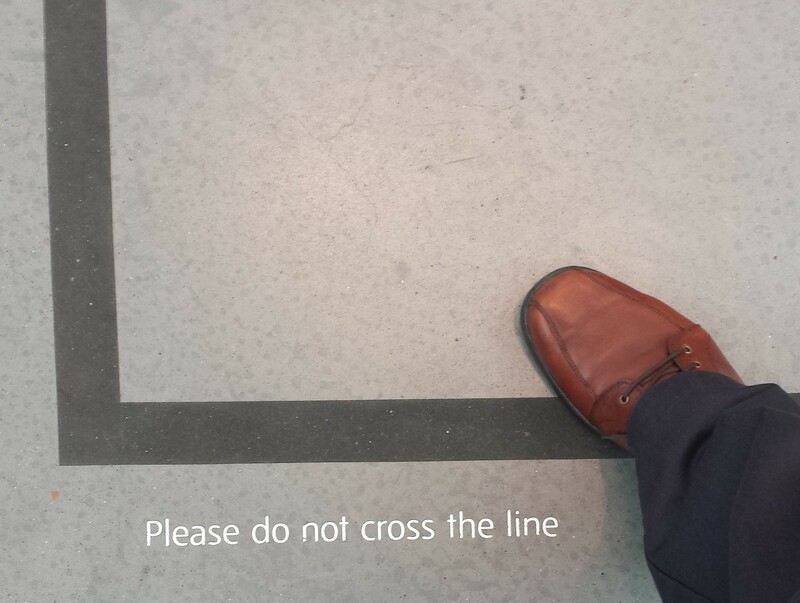 This can obviously become complicated, and you will need to decide what rules work for your particular context. Some high index elements that we identified were reference & circulation desks, computer workstations, and study rooms, while low identification elements were librarian offices, journals, and new books areas. Importantly, much high traffic library real estate was taken up by low-identification elements. In this way, the blank spaces of the drawings can also be especially informative. 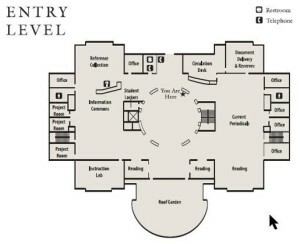 For example, in the following drawing almost the entire left side of the library is blank space. This area is where current periodicals are shelved. While I think this method is extremely informative for researchers, I would also recommend using caution in interpreting the results. 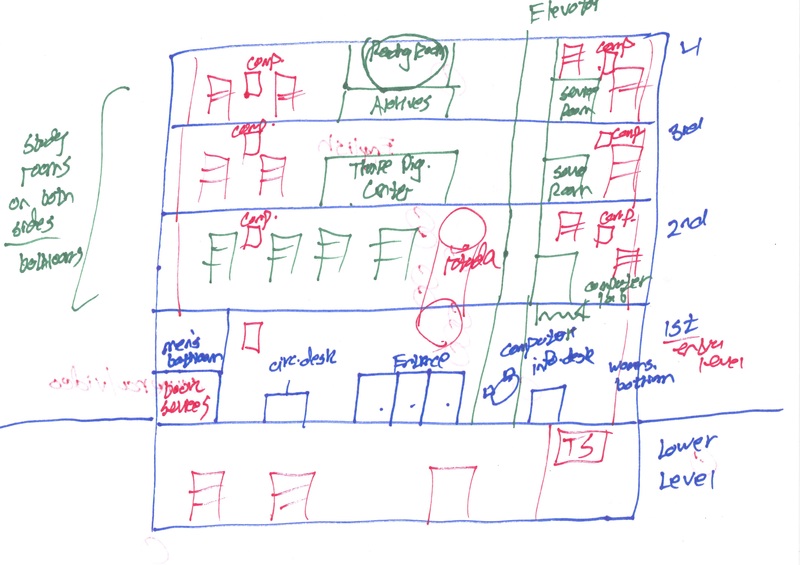 The assumptions about the association between an individual’s conception of the library and the drawn representation can be questioned, and there are also a variety of potential sampling bias issues in the way sketch map methods are usually collected (e.g. problems stemming from convenience samples). I therefore recommend utilizing this approach in conjunction with additional interviewing methods that can corroborate and add context to the findings.